Kari began her study of the Yang 40 form with Grand Master Ding in 2010. 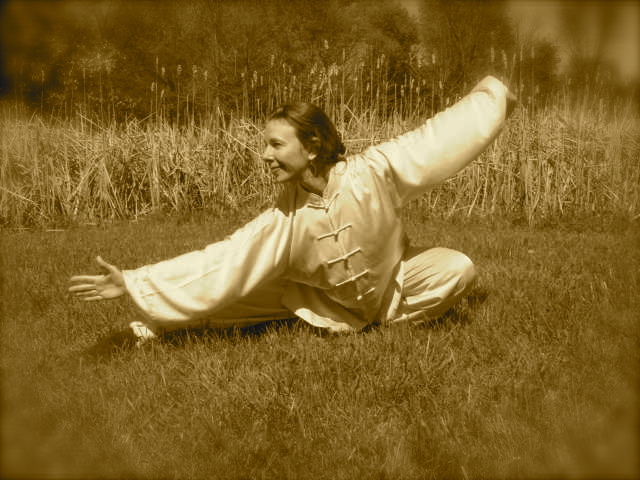 Under Master Ding’s sincere & joyful guidance, she also studies the Chen Sword 56 form, Qigong, Chinese language, & the fine art of freedom that comes with practice & embodiment of the principles of Taijiquan. She ﬁnds that consistent study with Grand Master Ding infuses her own life and teaching with poetry, and the inner qualities of stillness, patience, and equanimity. She is the founder of Onecologie: True health through intuitive synchronicity with nature. Scott Hall began his training in Taiji in 2006 studying Yang Style 24 and Yang Family Long Form (108) under the expert tutelage of You Yong and the Big Rock Tai Chi group at Cherokee Park in Louisville Kentucky. After 5 years of laying a solid foundation in the concepts of Taiji, in July of 2011, Scott began studying Chen Style (Hong Form) under Grandmaster Ding Mingye. Currently learning the style and depths of Chen Style 56 competition, Scott looks forward to learning YiLu (First) and ErLu (Second) routines as well as the Jian (Sword) routine, and deepening his studies further in Taiji. Steve Schumacher began his love of studying Yang style taiji in 1976 with a director at Actor’s Theater by the named Michael Hankins. Steve furthered his studies in taiji, when one of Michael Hankin’s students, Karen O’Bannon, went to Boulder, Colorado and brought back a style of taiji called Blue Poppy as developed by Bob Flaws. In August of 2011, Steve began to further his understanding of Yang style taiji under Grandmaster Ding Mingye and has enjoyed learning the deeper meanings of why you perform each move with the underlying applications.